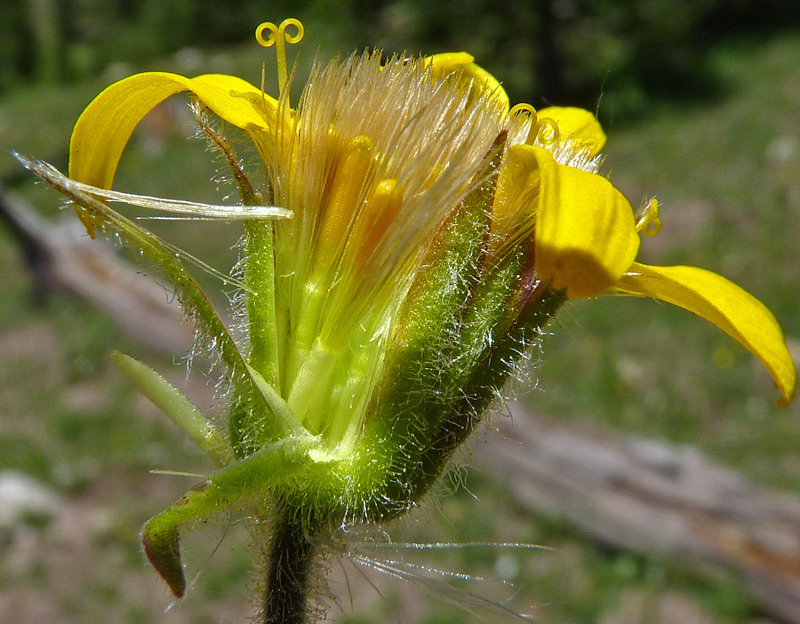 The ray flowers around the perimeter of the flower head are upright, cylindrical, very narrow, and each have one elongated, yellow, strap-like petal. The disk flowers are also upright, cylindrical, and very narrow, but they are lobed at the top of their cylinder and have no strap-like petal. The closed disk flowers in the above photograph are club-topped cylinders. At the top of each yellow/green seed and surrounding each flower, there are silky pappus hairs (which in Arnica mollis are light brown, not silvery as in many other Asteraceae). The appendages that subtend the entire flower head are phyllaries (also called bracts). These are long, hairy, and green with red pointed tips. The shape, color, hairiness, number, and arrangement of these phyllaries help identify Asteraceae species. In the above photograph, several ray flowers have fully opened, and their yellow, curled stigmas project above the flower head.